hansgrohe has now also brought the successful sBox roll-up hose system to the bathroom. hansgrohe’s new sBox Bathtub provides greater convenience and safety as well as a more appealing look. Already available for the kitchen since 2016, the sBox allows the shower hose to be pulled out and retracted smoothly and safely, and offers safe and easy installation. The sBox Bathtub represents the next step in the further development of the tried-and-tested system for use in the bathtub. In cases of concealed installation, it replaces the former Secuflex bathtub system. 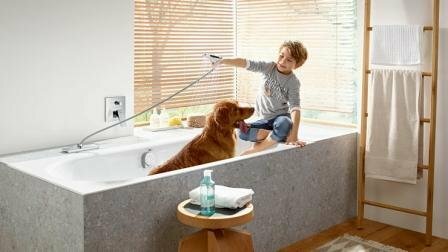 Thanks to hansgrohe, beautiful moments can be enjoyed not only with water, but also during installation, as the all-in-one system ensures exceptionally simple and fast installation of the sBox Bathtub system. The basic and finish sets each have different item numbers, allowing you to first order and install the basic set and then the finish set later on, once it’s time to install the faucets. An optional installation plate can also be supplied along with matching mounting brackets for installation inside the tile rim. The basic set consists of a cardboard placeholder to simulate the open space below the bathtub or tiles, a plaster cap as a placeholder for the installation frame to be used later on, a connection hose for connecting to the mixed-water line, a holder for the connection hose that prevents the shower hose from falling behind the bathtub, and a closure to flush the connected water pipe. The finish set contains the polypropylene (PP) box, the installation frame for bolting into place inside the bathtub or tile rim, an integrated G1/2 hose connection suitable for conventional hand showers, and the metal escutcheon for lasting durability and a high-quality feel. The sBox Bathtub can be used in the bathtub or tile rim, although the bathtub rim has to be wider than 71 mm. But then the sBox can be positioned as desired – wherever the hand shower visually integrates into the bathroom style the best. Two attractive designs and the concealed hose, which is now hidden below the bathtub or tile rim, also ensure an appealing look as well as more space in the bathtub for a highly enjoyable bathtub experience. And it’s also easier to use, as the sBox system requires 50 percent less pulling and 60 percent less holding force than with the hansgrohe Secuflex system. And if you’d like to shower standing in the bathtub, there’s no need to forgo comfort – the sBox hose extends 30 percent farther for a total length of 1.4 meters. The sBox, which has already proven its worth in the kitchen, is now also increasing comfort and relaxation in the bathroom. You can find additional information about the sBox Bathtub at www.hansgrohe.com.